The two companies will mitigate one of the frustration points of electric car ownership, the necessity to join multiple charging station networks, by creating a sort-of roaming agreement allowing members of each network to use charging stations of the other network. ECOtality and ChargePoint announced on Thursday a collaboration that will resolve a minor annoyance in electric vehicle ownership, the need to be a member in multiple charging station networks. The collaboration will allow Blink and ChargePoint network members to use charging stations belonging to either network, while in the background the companies exchange data and financial reconciliation between themselves. Currently public electric vehicle charging services are divided into several charging station networks. ChargePoint and Blink are the two big dawgs in the field and there are other companies entering such as NRG's eVgo. Most metropolitan areas have a mix of charging station operators, forcing electric car owners to become a member of each network. Each of the networks have different membership requirements and payment strategies, which increases confusion, difficulty and cost to the consumer. eVgo is based in Texas but is currently expanding into California and the Washington DC area. 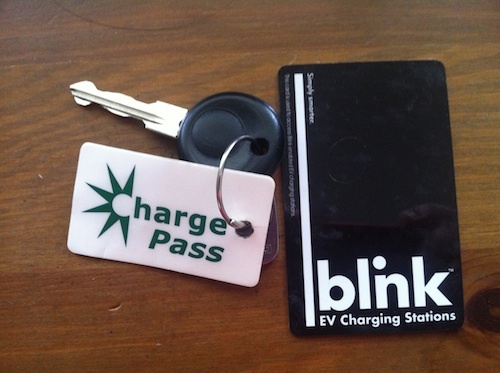 ChargePoint and Blink are both constantly expanding. In February, ChargePoint announced an expansion into Atlanta. To implement the agreement, ECOtality and ChargePoint have formed a new company, Collaboratev, LLC. That company will "enable charging network interoperability, exchange session data and allow financial billing reconciliation services among electric vehicle charging networks." The jargon means that Collaboratev will provide a service similar to that which happens between banks to enable sending money from one bank to another. Additionally Collaboratev plans to encourage other charging station network operators to join, with the vision of a allowing electric car drivers to "seamlessly charge among all affiliated charging networks." The connection between the Blink and ChargePoint networks will be implemented later this year. The goals sound like a breath of fresh air in the charging station field: Provide EV drivers with easy access to participating charging stations using common authentication credentials; Enable one bill for all charging usage; Accurately provide aggregated EV charging station location data; and Utilize open national interoperability standards. The announcement also addresses another minor frustration with using public electric car charging stations: Where are they? Many electric car owners also carry smart phones on which we install apps listing charging station locations. Blink has an app, and ChargePoint has an app, and there are several other app's that attempt to aggregate information from not only those two but other charging station networks. The problem we have is, sometimes entries in these maps are inaccurate, sometimes the charging stations are hard to find even when we have an address, and it's difficult to be certain whether the charging station will be available once you arrive. Sharing aggregated charging station location data should mean the Blink and ChargePoint apps will show each others charging stations. That will improve the situation just described, especially if the shared data also includes current status of the charging station (whether it's broken, or whether it's in use).